As its rivals roll over their version numbers with each minor change, Safari 5.1, which ships with Lion (Mac OS X 10.7) but is also available for Snow Leopard (version 10.6.8), plays it cool. That humble decimal upgrade, from 5.0 to 5.1, encompasses significant changes to Apple’s browser that help it compete far more respectably than its predecessor. The latest version also packs a few new surprises. 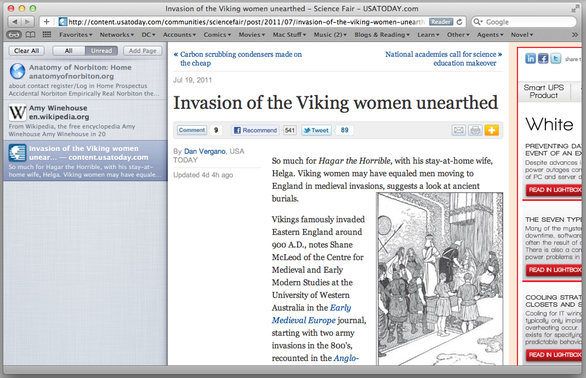 In addition, Lion enables full-screen surfing, although this mode frustratingly hides the handy Bookmarks Bar. If you keep all your favorite links there, as I do, moving your cursor all the way to the top of the screen, then waiting a half-second or so for the menubar and Bookmarks Bar to appear, may get old fast. In its favor, the full-screen Safari window becomes its own workspace, so you can use Lion’s three-finger-swipe gesture to slide Safari off the side of the screen and work in other apps; swipe back to resume browsing. This is a great, easy way to conserve screen space when you have multiple programs open. The new version introduces Reading List, a slick way to save the URLs of interesting pages for easy future reading. Sure, you could do the same thing with bookmarks, and plenty of third-party add-ons and Web services have long let you squirrel away lengthy online articles. (Services such as Instapaper and Read It Later even offer more power and functionality.) But for anyone who simply wants to set aside the occasional intriguing piece for later, Reading List is easy to add to, use, and manage. Since I usually download only one or two files at any given time, I like Safari 5.1’s new Downloads display. Previous versions of Safari opened a separate window to track in-progress downloads; this window either obscured your browsing or got lost in the background. Now, a small button with a miniature progress bar sits in the upper-right corner of Safari’s window, revealing a more-traditional list of downloads, in an iOS-style pop-over, when clicked. You can even drag completed downloads straight from this list to the desktop, a Finder window, or another program. Those who frequently download multiple files simultaneously will probably miss the older approach—in Safari 5.1, you need to view that pop-over display to track the progress of each download, and doing anything else in Safari hides the list—but it seems to be an improvement on the whole. In iOS, Apple seems to want to steer users away from web apps and into dedicated applications—often Apple’s own offerings. Safari 5.1 cleverly co-opts that strategy: When you first log in to a Gmail, AOL, or Yahoo account, Safari offers to transfer your email, chat, and calendar settings to Mail, iChat, and iCal, respectively. I tested this feature with Yahoo Mail, and my Mail Inbox promptly displayed all the spam I’d happily ignored in webmail. Behind the scenes, Safari 5.1 adds admirable privacy protections. Before autofilling information in web forms, the browser asks your permission and even lets you specify whether to pull info from Address Book or Outlook. 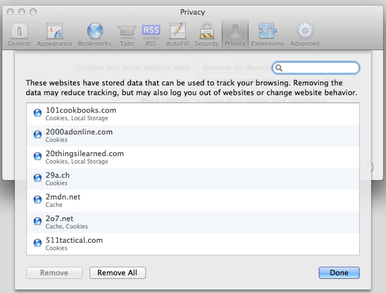 A new Privacy pane in Safari’s Preferences also better illuminates the websites tracking you. Rather than displaying a tangle of filenames, Safari 5.1 lists domains and the types of files—cookies, caches, plug-ins, and the like—each has stored on your Mac. You can delete these items by domain or all at once. Under Lion, Safari joins Google’s Chrome browser in “sandboxing” its operations to further secure the browser. According to Apple, Safari walls off each individual online interaction it makes, preventing any site’s malicious code from exploiting any other site you’re browsing, or from spreading to your Mac. In both Lion and Snow Leopard, Safari 5.1 also separates what it’s doing online from the processes actually that run the browser. In theory, even if one or more sites load slowly, or include content that would in the past bring Safari to a crawl, Safari 5.1 will still open menus and new tabs responsively. In my testing, Safari 5.1 did slow down when digesting resource-heavy sites, but it never completely locked up. My Safari tests found a few weird glitches. One particularly long article, viewed in Reader, initially choked Safari hard enough to crash the browser; it worked fine on the second try. And Safari can mistake a two-finger horizontal swipe—meant to go forward or back in the current tab’s history—for an attempt to scroll horizontally; on sites with blank space on each size, this can leave pages hanging half-off the edge of the browser window. In general, though, version 5.1 felt much faster and more capable than Safari 5.0, and at least on par with Firefox 5. Safari 5.1 renders XHTML nearly 30 percent faster than Chrome 12, three times faster than Firefox 5, and four times faster than Opera 11.5. In CSS rendering, Safari 5.1 was a little slower than Safari 5.0.5 and just barely faster than Chrome, but it soundly clobbered Opera and Firefox. Note that this score may vary depending on your machine. In a separate test on a 2.66GHz MacBook Pro with a Core i7 processor, 4GB of memory, and Snow Leopard installed, Safari 5.1’s SunSpider score (239.7 milliseconds) beat Chrome 12’s (401.6 milliseconds) by more than 40 percent.